4'x4' Bronze & Brass 4' Dial plate is elaborately engraved bronze with hour and date lines. Self-orienting dial. Locate line for the date; rotate dial until shadow tip touches that line. Read time from intersection of the shadow's tip and the time line radiating from dial center. Gnomon is a model of a naval missile, resting on an anchor. A ship's binnacle supports rotating sundial plate. As of July, 2012 the missile gnomon is missing. 18" Bronze on stone Gnomon 10" long, 6.25" high 'United States Naval Hospital Annapolis MD' on dial face below 6AM/PM lines. Tells local apparent time. Has Arabic numerals, hour lines and shorter half-hour lines. Dial sits atop a circular stone pedestal with beveled capital. A bronze armillary dial with meridian, horizon and equatorial rings on a concrete pedestal. Dial is located in Government House residence and requires a tour of the property for access. Nice horizontal dial sitting on a 6 x 4 foot stone pedestal. The dial itself is 5 foot in diameter with a 2.5 foot gnomon of open-work bronze. The lines, numerals and lettering of the dial face are so finely done that one cannot tell whether the dial plate was made of cast stone or was carved by an extraordinarily skilled mason. The gnomon, unfortunately, is situated incorrectly on the dial face. The point at which the stile diverges from the dial plate is about five inches south of the correct point where the hour lines converge. A horizontal dial 36 inches in diameter, made of bronze, sitting on an irregular pentagonal block of granite. Gnomon missing. Calibrated to read local solar time, and has a graph of the Equation of Time to correct readings to standard time. A 12 inch diameter horizontal bronze dial. A wire is stretched from the dial's center, which is decorated as a cluster of flowers, to the beak of a bird perched on the rim of the dial plate, forming the gnomon at proper angle. The bird is apparently the 'early bird' eating the worm (gnomon). The dial plate itself has hour lines and Roman numerals from 5 am to 7 pm. Dial sits atop a cast concrete post with octagonal top. The dial is a partial cylinder held upright at the proper angle by four ornate pillars. The gnomon is a wire stretched between another pillar at the south edge and the mouth of an eagle mounted on another pillar at the north edge. On the wire is a bead, the shadow of which falls on the cylindrical plate. The cylindrical plate has an analemma for each daylight hour of standard time.' (McDowell) One of three known to be made in this design. Another dial of this design, once in front of the Physical Laboratory at Northwestern University, was placed at a private residence in New Hampshire in 1973, Evanston, IL. 18 x29 inch vertical dial. Solar noon analemma, equinox and solstice lines, horizontal lines, line showing approx shadow lengths on April 15 and Aug 31. Lines sandblasted into veined white Carrera marble. Dial is calibrated for EDT. AM hours indicated by shadow of stile's western edge, PM, by shadow of its eastern edge. When shadow tip is bisected by appropriate seasonal segment of the line of the analemma, it is 1:06:35 PM. A simple but elegant horizontal bronze dial approximately 18 inches in diameter. Design is a standard design used at U.S. Naval Hospitals. This dial was built specifically for Bethesda Naval Medical Center. Has plain raised hour lines and half-hour lines with Arabic numerals. The dial tells time from 6 AM to 6 PM. The dial base is octagonal stone that tapers into a graceful pillar. The dial sits in a shallow stone bowl about 3 feet from the ground. A simple but elegant horizontal bronze dial approximately 18 inches in diameter. Design is a standard design used at U.S. Naval Hospitals. Has plain raised hour lines and half-hour lines with Arabic numerals. The dial tells time from 6 AM to 6 PM. The accompanying plaque reads, "Cast especially for the Naval Hospital at Brooklyn, New York. This bronze sundial stood on the grounds from 1924 until the hospital was disestablished in June 1948?" The dial is reclined by two degrees to accommodate the latitude of Bethesda, MD. The dial sets on a simple cylindrical pillar. A simple but elegant horizontal bronze dial approximately 18 inches in diameter. Design is a standard design used at U.S. Naval Hospitals. Has plain raised hour lines and half-hour lines with Arabic numerals. The dial tells time from 6 AM to 6 PM. The accompanying plaque reads, "This sundial stood on the grounds of the Old Naval Hospital at Hospital Point Pearl Harbor, Hawaii during the Japanese attack of 7 December 1941. The dial is inclined to accommodate the latitude of Bethesda, MD. The dial sets on a simple cylindrical pillar. A small vertical stone dial with a weathered wood gnomon is mounted with iron brackets to the wall of Sacred Heart Chapel. The dial is about 26 inches wide by 16 inches high. The inscribed longitude of 00 deg 20 min East is correct for the United States Prime Meridian which goes approximately up 16th Street in Washington DC. In 1853, fire destroyed everything but the walls of the chapel; it was reconstructed in 1858. The present stone dial is reported to have been made by Francis J. Deutsch, Sr., replacing and duplicating the original. See NASS Compendium Vol. 5, No. 3, Sept., 1998. The whole dial is now covered with white paint and the gnomon which is set at 42? is placed upside down. The wall is 7? SE but the dial was designed for true south. Very large horizontal dial 25 foot in diameter. Concrete dial with bronze gnomon 6' 6" high at tip. Has hour markers on raised circular slab. Metal disc with university seal in center of pierced gnomon. Adjacent graph provided correction for both EOT and mean/standard time differences. Due north or gnomon are shadow markers for date of year. 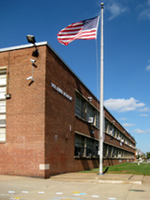 Relocated May 1991 to present site. Briggs Commemorative Sundial. One of the more complex and elaborate ones in the US. The dial plate lies parallel to the earth's axis of rotation. The dial has three gnomons. The upper and lower point out Eastern Standard time, the middle one indicates local apparent (solar) time throughout the year. A copy of the brochure is in the NASS Archives. A 26 inch hexagonal, English-made slate horizontal dial with a 3/8-inch thick, knife-edge bronze gnomon and no noon gap. Dial face has hour, half-hour and quarter-hour marks in inner bands, and 3-minute marks in the outer band. Hours are marked with Roman numerals. The dial sits on a hexagonal pedestal carved with coats-of-arms of families that lived at the plantation, including the Plater, Briscoe and Satterlee families. The dial face has four concentric bands of hour numerals. The outer band reads local time with an inscription that notes local noon is also noon at Boston, Peru and C. Redondo, and midnight at Borneo and Chinese Tartary. The second band shows noon in New Zealand, London and other locations. Two additional inner bands show noon in still other cities around the world. The plantation house overlooking the Patuxent River was constructed between 1710 and 1717 by James Bowles. Bowles died in 1727 and Sotterley Plantation passed through Plater and Briscoe ownership. The plantation was bought by Herbert L. Satterlee in 1910 and restored, including his vision of an 18th century garden in which he placed this sundial, received as a gift, in 1925. Admission fee is required. Call 301-373-2280 for hours. A simple stainless steel gnomon 5-inches in diameter sits on a 6-foot concrete dais. Surrounding the dais are brick pavers with two circular bands of granite pavers. The interior band is for daylight saving time hours of engraved numbers filled with a gold color and a similar outer band for standard time hours. The granite pavers also mark the cardinal points engraved in gold, and extended as east-west and north-south lines from the dais. What makes this dial both unique and beautiful is the low brick and concrete surrounding walls with inscriptions from famous authors on both the interior and exterior faces. Cement cylinder dial with an inside radius of about 18 inches and a concrete gnomon 5 inches thick. The hour is read on the top 9summer) face in Roman numerals from VII to XVII; the scale is offset for longitude correction. The cylindrical inner face is stainless steel with an engraved grid of quarter hours and months, with an equation of time curve on every hour. A brass horizontal dial 11.5 inches in diameter with a 7 inch high gnomon. The dial is intricately engraved and includes compass points and gradations of the clock to two minutes. Made by "E. Nairne", a London dial maker in the 1750's to 1800. Rector Stephanie Chase Wilson says "I believe it was made specifically for our church as it has the name "All St.s Parish Calvt County" written on the face on the opposite side from "E. Nairne." The oral history of its origins is that it was commissioned by the Rev. Thomas Claggett, rector of All Saints from 1769-1777, and again from 1786-1792. He gave the sundial to the church in thanksgiving for being called as the first Bishop consecrated on American soil on September 17, 1792 in Trinity Church, New York." "About 15-20 years ago the sundial was stolen from the church, but a quick-thinking parishioner got word out to every antique store within 100 miles and several days later it was recovered. A replica was created and now sits outside the church on a pedestal. The original is under lock and key. The only special care it gets is an occasional dusting. " A bronze horizontal dial made inscribed "1715". About 10 inches in diameter with an ornately decorated dial plate. The original gnomon has been removed and a modern garden sundial placed over the original dial face; little of the original face is visible. The dial is on a square stone that sits atop a plane square cut stone pillar. A 20 foot diameter horizontal dial in the middle of a brick patio. The gnomon, about 12 inches wide and 8 feet tall, is made of thin wood painted a verdant green and edged with molding. The dial face is a bed of flowers with hour lines of small plants, all immaculately kept by gardener and dial builder Roger Haynes. Around the circumference of the dial are Arabic number placards for each hour from 6am to 6pm. The flowers are changed seasonally for a gardener?s delight, and during the winter when the plants are dormant, the gnomon is removed and the area is used for a winter light show. John Carmichael explained the origin of the dial (July 2003): Roger Haynes is the head groundskeeper at Brookside and he came across my website somehow about two years ago and asked me to help him design a sundial for the gardens. We discussed all sorts of ideas, but settled on this untraditional yet traditional living plant design. The park was very short of funds, so Roger had to do a lot of lobbying to get it pushed through the powers that be. But I think he did a great job considering we did all our communicating via email and drawings. I can't wait to see how it will change as it grows and as they change the plants every season. Roger Hayes reports that this dial will be removed in November, 2009.